KLS Gogte Institute of Technology is one of the prominent institutes in the State of Karnataka offering education in the field of Engineering and Technology. KLS GIT is an Autonomous Institution under Visvesvaraya Technological University, Belagavi and one of the most preferred institutes by meritorious students. The best part of the institute is the perfect balance between core academics, curriculum & extra curriculum activities for the students. The students have excelled in academics by bagging maximum ranks at university level and also won state and national level prizes in various technical competitions, Debate and cultural programmes. The interaction with industry experts, researchers and corporate leaders are arranged in the campus all through the year. Dr. Raghunath Mashelkar, Bharat Dhabolkar, Chetan Bhagat, Santosh Hegde, Sudhindra Haldodderi, Nitin Gokhale, Subhrato Bagchi etc… are few names who has wonderfully interacted with the students in past few years. All the technical and cultural programmes in the institute are managed and coordinated by the students. These skills are of great use and develop confidence among the students in managing the events at mega scale and also develop an attitude to work in team. 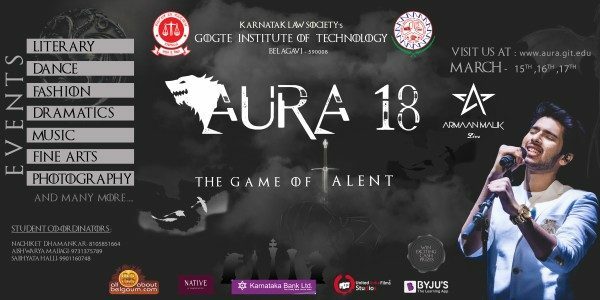 Aura-18” will have multiple cultural events within it like Dance, Literary Events, Music, Fine Arts, Dramatics, Fashion Show and Mr & Miss Aura. Renowned bollywood singers like KK, Sunidhi Chauhan, Farhan Akthar, Shankar Mahadevan, Vishal – Shekahr, Amit Trivedi have rocked the stage by performing live @GIT. This year a famous playback singer Mr. Armaan Malik and group will perform Live in concert as a part of this mega cultural event. “Aura -18” is scheduled from 15th to 17th March 2018. These three days more than 2000 students from various academic institutes will showcase their talents in various events. Students from all the academic institutes are invited to participate in this event. Interested students can register through online using link given below. Can audience come to watch the event? ?